We bring forth an exclusive range of satin padded hangers, that are used in various sectors such as apparel, fashion, retail as well as households. Fabricated using hi-impact metal, these hangers are known for their high strength, light weight and better durability. Satin and foam are wrapped on a wooden hanger in arched shape. Wide range of colors available. Chrome finish hook. - Satin padded coat hangers with gilt swivel hook. - Pretty central ribbon trim. Strengthened inner wooden bar. - Excellent high quality coat hanger. - Ideal as a gift or to give your wardrobe a fresh, luxurious look. 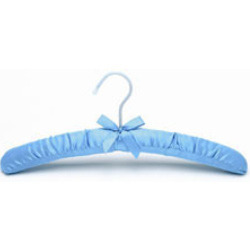 - Gorgeous, Soft, Satin Padded Coat Hangers. We are highly acknowledged organization engaged in presenting a remarkable range of Padded Hanger.